What a wonderful Christmas at Luther weekend! Thank you students, faculty and staff who worked hard to create a stunning program and to host nearly 8,000 visitors. Surely our guests returned home feeling grateful for this special college and the way Christmas at Luther reminds us of the power and radiance of God's love. As we approach final exams and other end-of-the-semester activities, we want to wish you and your loved ones a safe and joyous holiday. A reminder that the Luther College faculty/staff Christmas party will be held from 11:30 a.m.-2 p.m. this Friday, Dec. 11. Luncheon fare will be served at stations throughout the upper level of the Union. The last day to sign up is tomorrow, Dec. 9. RSVP online at https://www.luther.edu/president/christmas-party/. Open enrollment is the annual opportunity to enroll in or make changes to health and dental plan elections, and to elect health or dependent care flexible spending accounts for 2016. Completed forms are due to the Human Resources office by Tuesday, Dec. 15. All forms are available on the HR website. Questions? Contact HR, 387-1134. The Benefits Study Group will host two information sessions for faculty and staff to hear an update about the initial recommendations that the group is considering for tuition and retirement benefits. Join Benefits Study Group members Eric Runestad, Derek Hartl and Scott Carlson from 3:30-4:30 p.m. Tuesday, Dec. 15, or from 9-10 a.m. Wednesday, Dec. 16, in the CFL Recital Hall. All students, faculty and staff are encouraged to sign up to receive electronic versions of IRS Form W-2, Wage and Tax Statement, using my.luther.edu. With an electronic W-2 form, you will receive your W-2 no matter where you are next semester, there is no risk that your W-2 will get lost or stolen, and if you misplace your W-2, you can easily print another one. The W-2 Electronic Consent option is included in the employee profile section of my.luther.edu. If you chose the electronic W-2 option for 2014, then you do not need to do it again for 2015. Detailed instructions and additional information can be found by clicking the "W-2 Options" link on the HR website. Mac users: please do not use the "Preview" application to view your W-2. Remember, the electronic option is the sustainable option. The college will be closed Dec. 24-25 for the Christmas holiday. This holiday schedule limits time for processing bi-weekly payroll for the pay period ending Dec. 18 with a pay date of Dec. 30. Therefore, timecards for the pay period ending Dec. 18 will be due in the Payroll Office by noon Monday, Dec. 21. Supervisors, please review and sign all time cards and hand deliver them to the Payroll Office by noon Monday, Dec. 21. Contact Korrine in the Payroll Office, 387-1135, or Andrew in the Office for Financial Services, 387-1697, with any questions. The December staff meeting will be a Christmas party held at 9 a.m. Wednesday, Dec. 9, in Peace Dining Room. This year's theme is "A Very Prairie Christmas." Staff are invited to bring a monetary donation for the First Lutheran Church Food Pantry, as cash gifts allow the Pantry to purchase in bulk. 2015-16 Luther College catalogs are being distributed to faculty and staff. Those who did not receive a catalog or need an additional catalog should contact the Registrar's Office, 387-1167. Extra copies are also available on the self-service counter located outside the Registrar's Office, Main 123. The Just Action Group invites members and friends of the Luther community to read and endorse its recent statement of solidarity with Muslim students in the wake of widespread Islamophobia in the U.S. For more information, visit the Just Action website. Dec. 11 is the due date for books checked out from the main stacks by faculty and staff on or before Sunday, Dec. 6. Books checked out by faculty and staff may be renewed online or by e-mailing <library>. The new due date is May 13, the last day of classes for spring semester. Books that have already been renewed three times (two years) will not be renewed again; instead, physically bring these books to the circulation desk to have them checked in and then out again to "re-start the clock." To view checked-out items and due dates, go to the Library website and click on "Library Account." Sign in with your Norse Key, and then click on "My Library Account" in the upper right corner of the page. The Campus Programming office is excited to announce that Bryan Stevenson will be the 2015-16 Farwell Distinguished Lecturer. He will speak on "Mercy, Humanity, and Making a Difference" at 7 p.m. Tuesday, March 1, in the CFL Main Hall. Stevenson is the founder of the Equal Justice Initiative, author of "Just Mercy," and one of Time magazine's "Most Influential People in 2015." Connections with curricular planning are actively encouraged, supporting campus wide conversation. Questions? Contact Tanya, <gertta01>. A campus programming reminder to all that Tuesday-Sunday, Dec. 8-13, is considered finals prep week and is intended to provide additional space for students to prepare for tests, papers and finals. These six days are set aside for academic preparation for finals, and Luther does not schedule public events during this time, including student-led events. Exceptions include only athletic events, social gatherings, Christmas in the Union and Kwanzaa. The free massage was donated by the Wellness Program, not Health Service. A heartfelt thank-you to all who are supporting the United Way this season. A prize drawing among donors who have already contributed was held Nov. 23. Lisa Tangen won a Luther sweatshirt donated by the Book Shop. Chelle Meyer won an hour massage donated by the Wellness Program. Kathryn Reed and Ramona Nelson won tickets to Wu Man and the Shanghai Quartet, and Imani Winds respectively, donated by the Center Stage Series. And Norma Hervey, Carol Gilbertson and Mark Muggli, Ruth and Will Bunge, Lori Ostlie, and Doug Nelson all won two tickets to Peace Brunch, donated by Dining Services. The Center for Sustainable Communities has partnered with Trex Composite Lumber and Fareway to recycle plastic film on campus. Plastic film includes all stretchable plastic packaging from grocery bags to bubble wrap. Trex recycles the plastic wrapping into LEED-certified composite lumber. If Luther collects 500 pounds of plastic film by April 2016, Trex will donate a bench made from recycled materials. For a complete list of recyclable materials and campus drop-off locations, please visit the recycling website. 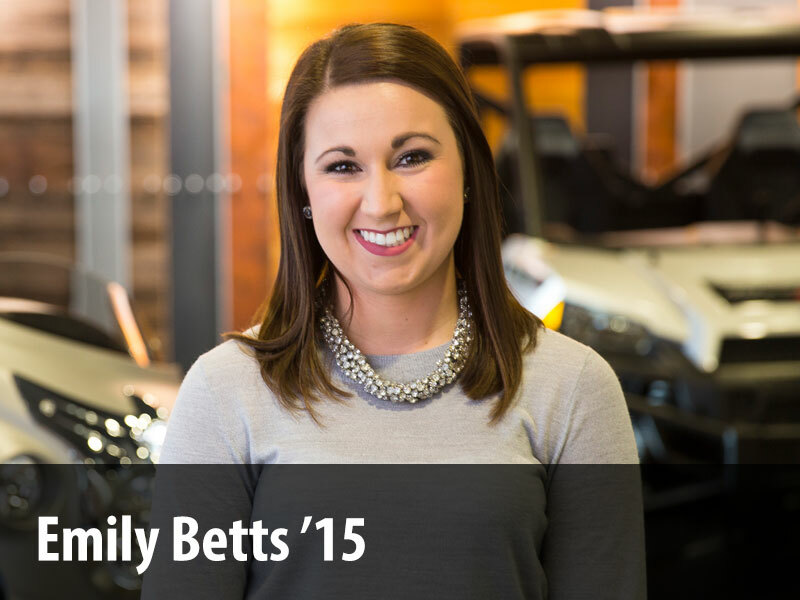 Kelsey Wauters '11 talks about how her education serves her work as an auditor. She says the most valuable skill she learned at Luther was critical thinking. "As an auditor, I wouldn't be doing my job if I took something at face value, so I'm always critically evaluating and questioning the appropriateness of decisions being made by our clients," she says. Onward Mahachi '18 discusses his work-study jobs as a Caf student manager, SASC tutor and mathematics grader. Need a quick break? Join colleagues for a three-minute pilates or yoga video on Akimboo.com. Luther faculty and staff have a free subscription to Akimboo as part of Luther's wellness program. Please join us for a reception celebrating Lorraine's many years of faithful service to Luther College. Lorraine's exceptional skills, her warmth and her generous spirit will be missed by all who have had the pleasure of working with her. The reception will be held from 2:30-4 p.m. Wednesday, Dec. 9, in the CFL Lobby. Santa will make an early stop in Decorah as Luther celebrates Christmas in the Union from 4:30-6:30 p.m., Wednesday, Dec. 9, in the lobby of the Union. Activities include cookie decorating, crafts, a holiday movie, music and games. Holiday treats will be served and there will be an opportunity for pictures with Santa by the fireplace from 5-6:30 p.m. Christmas in the Union is sponsored by the Book Shop, SAC Special Events and Dining Services. The Luther Book Shop will also host a full day of activities from 8:45 a.m.-6:30 p.m. Wednesday, Dec. 9. In-store specials and popcorn will be offered throughout the day, and shoppers wearing an ugly Christmas sweater will receive a treat. Visitors to the Book Shop can also sign Santa's Naughty or Nice list and take photos with Buddy the Elf from 3-6:30 p.m. The Luther College Emeritus Colloquium will meet at 3 p.m. Thursday, Dec. 10, in the Mott Room. Richard Ylvisaker will consider the topic "The Supreme Court and Gay Marriage." All interested members of the Luther community are encouraged to attend. Join the Luther community as we mark the festival of Kwanzaa—sharing talent, memories, food and conversation—with a special Kwanzaa chapel at 10:30 a.m. Friday, Dec. 11, and a Kwanzaa festival dinner at 4 p.m. Saturday, Dec. 12, in Peace Dining Room. Tickets for the dinner are $13.50 and can be purchased in the Diversity Center. To Megan and Munch Sherman on the birth of their baby boy, Levi Finck Sherman. Levi was welcomed into the Sherman family on Thanksgiving morning, Thursday, Nov. 26, and joins big sister, Lizabeth, 2. Linda Jennings has announced her retirement after 23 years, effective Jan. 4. We thank Linda for her dedicated service to the college. Custodian: The custodial department has an opening for a full-time, 12-month position. General custodial responsibilities include overall appearance of assigned academic and residence hall building(s). Hours will generally be 2-10 p.m. Monday-Friday. Some weekend work may be required. Must be able to work with little supervision, complete work thoroughly and promptly and be self-motivated. High school diploma or equivalent required. Campus pastor: The Pastoral Call Committee is seeking nominations and applications for a college pastor to serve with the pastoral team in Luther's Office for College Ministries. The college pastor will serve the Luther College Student Congregation (an ELCA student congregation) and serve as a spiritual leader for the campus community. The college pastor will preside and preach regularly, lead Bible studies, provide pastoral care and counseling, mentor student leaders and advise student groups that address religious questions and issues. The college pastor will also help plan and lead ceremonies and special events on campus, and he or she will represent the college at church-related activities off campus. Administrative assistant: College Ministries has an opening for a .83 FTE administrative assistant. The College Ministries administrative assistant coordinates the administrative and clerical work of the office, as well as external communication with congregations, pastors and various church offices. The administrative assistant plays a key role in welcoming students and assessing requests for mentoring and pastoral care. Qualified candidates will have a minimum of four years office experience as well as excellent organizational, problem solving and communication skills. A college degree, experience working in higher education, or church office experience is preferred. Coordinator of diversity recruitment: The Admissions Office seeks a full-time coordinator of diversity recruitment to work with area programs serving underrepresented students, assist in the recruitment of students to Luther College and assist with retention efforts for students of color. Must be willing to travel extensively and make public presentations. Candidates must have a valid driver's license and a positive driving record that will enable them to be insured through the college. B.A. or B.S. required with academic preparation in any discipline, but must have above average written and verbal communication skills. Recent degree from Luther solicited but not required. One year of relevant post-graduate experience recommended. Experience in sales, marketing, communication and education is highly desirable. Spanish speakers are strongly encouraged to apply. Maryna Bazylevych presented her research paper "Demystifying Wellbeing and Health Threat: Categories of Risk among Young People in Ukraine" at the 114th Annual Meeting of the American Anthropological Association in Denver. This work is based on summer ethnographic research in Ukraine, supported by the Nena Amundson Professorship Award. Anthropology and biology major Brittany Anderson '16, collaborated on this research. Anne Blocker has achieved board certification as a specialist in sports dietetics. To become board certified by the Commission on Dietetic Registration, the credentialing agency for the Academy of Nutrition and Dietetics, a registered dietitian must successfully meet rigorous specialty practice requirements and pass a nationally administered examination. Blocker works with students individually and provides pre-season athletic nutrition workshops for several Luther athletic teams. Sean D. Burke presented "Reading the Bible with the Eunuchs" on Nov. 22 in the LGBTI/Queer Hermeneutics section of the Society of Biblical Literature's Annual Meeting in Atlanta. Ed Tebbenhoff's essay, "Le Nombre de parrains dans les communautes reformees neerlandaises de Novelle Holland, New York et du New Jersey, 1639-1800" was published in the book,"Le Parrainage en Europe et en Amerique: pratiques de longe duree, XVI-XXI siecles," edited by Guido Alfani, Vincent Gourdon and Isabelle Robin and published by Peter Lang. The paper was originally delivered at a conference on Comparative Baptismal Rituals and Godparenthood, held at the University of Paris, Sorbonne, in December 2011. Singers wanted: First Lutheran Church will host a community Messiah sing-a-long, conducted by Jennaya Robison, at 7 p.m. Friday, Dec. 11. Luther students, faculty and staff are invited to join singers from First Lutheran and the Decorah community in singing Part I (the Christmas portion) of Handel's "Messiah." The concert will begin with a brass-led Christmas carol "warm-up" and end with a reception in the Fellowship Hall. Bring a Messiah score, or purchase a score for $10 or rent a score for $5 at the concert. The $5 will be refunded when the score is returned. Not interested in singing? Enjoy the concert as an audience member. A free-will offering will be taken to benefit the Community Food Pantry at First Lutheran. Contact Jennaya for more information. Found: A phone was found in the grassy area behind the Olin Building on Monday, Nov. 30. Please go to the administrative office on the third floor of Olin to identify and claim. Babysitter/pet sitter available: First-year student on winter break from the University of Iowa looking for babysitting, pet sitting, house sitting or other jobs. Available Dec. 19-Jan. 15. From Decorah, very responsible, can provide references. Please email inquiries to Molly, [email protected]. For sale: Brand new GoPro Hero 3, never been used. $260. Contact Shelby, <nelssh05>. For sale: Slumberland sofa sleeper, in excellent condition. $200 or best offer. You haul. Located in Caledonia, Minnesota. Contact Melissa, <bothme01>, if you would like to see a picture. For sale: Paul Reed Smith SE Standard electric guitar. F14613. Matte vintage cherry. $300. Like new. Contact Maryna, <bazyma01>. For sale: Alvarez Regent acoustic guitar RD8 with case, extra strings, tuner and assorted picks included. $120. Contact Maryna, <bazyma01>. For sale: Peavey Foundation bass guitar. Has cosmetic scratches, but plays very well. Shipped from factory on Dec. 12, 1995. Asking $125. Comes with soft case and guitar stand. Contact Tim, <schweizt> or 419-1886. For sale: Salomon XScream 179 cm Prolink downhill skis with Salomon S710 bindings. Includes two Rosignol Quantum poles. Asking $75. Contact Tim, <schweizt> or 419-1886. For sale: Seasoned oak and cherry firewood. Easy pickup, in town by hard surface road. Best offer. Contact Dave, 380-3939. Housing wanted: Adjunct faculty member looking for J-term lodging. Not a resident of Decorah or surrounding area. Looking for an empty house or a house-sitting opportunity for Jan. 2-28. Willing to take care of things, i.e. water plants, feed animals, etc. A room in an occupied house would be okay as well, though not ideal. Contact Eric, <ashcro01>. Thank you so much. For sale: 54-inch Sony flat screen TV and glass stand. TV is in excellent condition. Bulbs in the television were replaced in 2011. Glass stand is 58.5 inches long and 22 inches tall; also in excellent condition. Has two open shelves. $250 or best offer. Contact Russell, <schoru01>. For sale: Seeking new home for a Franz Hoffmann Prelude half-size violin, bow, shoulder rest and case. Asking $75. Excellent starter violin in great condition. Contact Ann, [email protected]. For sale: 20-inch kid's bike, L.L. Bean Ridge Runner in red and black, 6061 aluminum alloy tubing system. Asking $75. Excellent condition. Contact Ann, [email protected]. For rent: One bedroom home for rent at 506 W. Main St. Only blocks away from downtown Decorah and the bike trail. Appliances included, central air, all rooms are on the main level. Contact Tade, [email protected] or 380-1415. For rent: Three to four bedroom house for rent at 412 Winnebago St. Two and a half baths, hardwood floors throughout. The home has a main-level master suite with private bath and a main-level laundry. Stove, refrigerator, washer and dryer are provided. This house is only blocks away from the downtown area, schools and trails. The yard is fenced and pets will be allowed with references. Rent is $750 per month. Email Tade, [email protected], for a rental application. For sale: Pedal board for guitar effects pedals. Pedal board is new, 32 x 16-inch and very solid. Comes with heavy duty velcro. Asking only $25. If you want the Odyssey ATA-approved flight case for it, I will sell both for only $150. Contact Tim, <schweizt> or 419-1886. All the best to professors and students alike during finals week next week!